LOCKSMITHS FOR LESS, LLC® offers friendly service with a smile to anyone who needs a key copied, a question answered or professional advice. We provide our customers with solutions that meet their unique requirements. 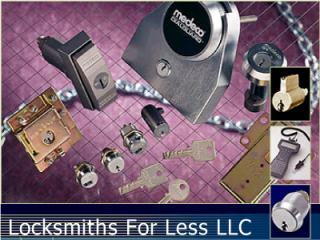 LOCKSMITHS FOR LESS, LLC® has been protecting people and their property from unfortunate incidents for over 36 years. We pride ourselves on being a mobile company where customer service means timeliness, quality work and a friendly attitude. The professionals at LOCKSMITHS FOR LESS, LLC® are licensed, bonded, certified and insured to ensure you get honest, intelligent and courteous service.